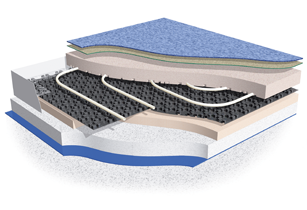 A manifold is required wherever underfloor heating is to be installed to serve two or more plumbed circuits from the boiler (or other primary heat source). 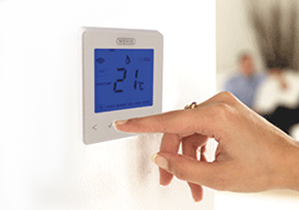 When underfloor heating is being connected to a high temperature heat source which also controls hot water or radiators, a mixing unit is connected to the manifold to mix the water to the required temperature for the system. The Hep2O underfloor heating range includes manifold solutions that can be tailored to each situation. The composite manifold can be sized to serve the exact number of individual underfloor heating circuits up to a maximum of 15 circuits. Single circuit installations which require water temperature control will be connected to their heat source via a mixing unit, but will not require a full manifold. See our video to find out more about what makes our manifold different from others on the market. 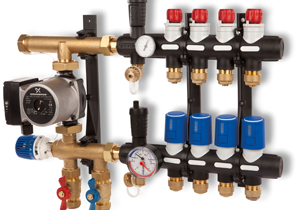 The unique Hep2O manifold is easy to install and gives you unrivalled flexibility. A cost effective way to control a single room or smaller project is to use a single circuit control. This incorporates a standard circulator with an advanced mixer valve, to ensure the water flows at the correct temperature round the system. A single control is suitable for circuits smaller than 100m2 with a heated floor area of 20m2 or less. Simply use an adaptor and spigot elbow to connect to the pipe circuit to the unit. For rooms of up to 24m2 you can split the coil and use a tee fitting to create 2 circuits.